Down Wind Sports was officially formed and opened in September of 1976 and located in the University Shopping Center on North Third Street in Marquette. Dennis and Nancy Henderson created Down Wind as a way to return to their native U.P. and to the Marquette area. Initially, Down Wind sold a great number of Frostline Kits, a pre cut sewing kit for outdoor clothing and equipment. Additionally Hobie Cats and related sailing gear were also sold. (The name Down Wind came from the combination of down sewing kits and wind from sailing). After two years, Down Wind moved to a larger store within the shopping center and gradually began adding outdoor specialty products to their inventory. The first clothing line that was brought into the store was a little known company called Patagonia. We are proud of the fact that we were one of the first Patagonia dealers in the midwest! Over the years, we have been the first to introduce windsurfing, snowboarding and sea kayaking to the Marquette area. In 1982 in search of a larger store the Henderson’s moved the business to its present location at 514 North Third street. In 1992 a much need addition was added onto the back of the store to accommodate the paddling department. In 1998 long time employees Bill Thompson, Todd King, and Jeff Stasser purchased DWS and took over ownership. In 2001 a new addition was added to the building and a new parking lot was built in the back of the building to allow parking on the side and rear of the building. Our new addition houses the camping, footwear, clothing and travel departments. Also two more changing rooms were added- no more waiting, yeah! 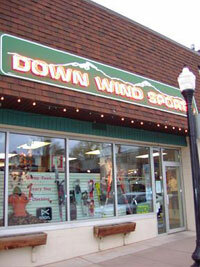 Down Wind Sports North was established in October of 1988 by the Henderson’s and former employee Tim Rohaly. Located on Shelden Ave. in downtown Houghton, this store created its own image by adding some products unique to the Houghton market, while selling many of the same products sold in the Marquette store. In October of 1995, as a result of a major fire that burned down the Library Bar and Restaurant, DWS North moved to the Sharon Center and was located in the spaced currently housing the Ming Super Buffet. In May of 2000, Arni Ronis, Bill, Jeff, and Todd purchased DWS North from Tim and moved the store back downtown to its present location at 308 Shelden Ave. We enjoy having our shops located in college towns as many old customers and friends stop by just to say “Hey” and exchange stories from the past. We hope you’ll stop by the next time you’re in town!